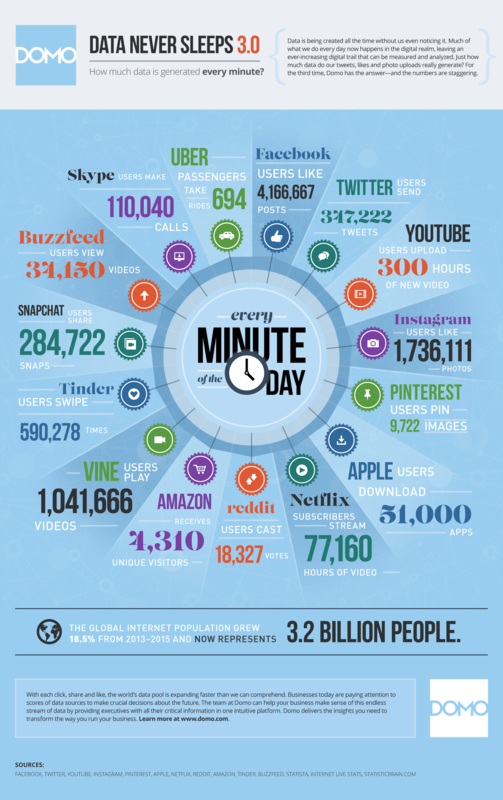 See the updated Data Never Sleeps 4.0 Infographic here! Twice now, Domo has created infographics showing just how fast data proliferates. The amount of data that can be produced in a single minute is mind-numbing and shows no sign of slowing down. Our third infographic installment reveals astonishing leaps in digital consumption. Since 2013, the global internet population grew nearly 20% – from 2.4 billion to 3.2 billion people. Connectedness paves the way for innovation, and we see that happening every year with new technologies and services. Vine, for example, didn’t even exist when we released our first infographic. Today, over 1 million Vines are watched every minute, and top Viners earn tens of thousands of dollars per month in sponsorships – for making six-second videos. Welcome to 2015. At Domopalooza, Jer Thorp said: “Not only are we doing more with data, data is doing more with us.” He’s right. For consumers and business users alike, improving our lives requires a deep understanding of what those interactions with data mean. Our stories are being written across the digital landscape, and it’s incredible to watch. Have a look.